The behind the scene photos of last filming of young actors on the set were made public. 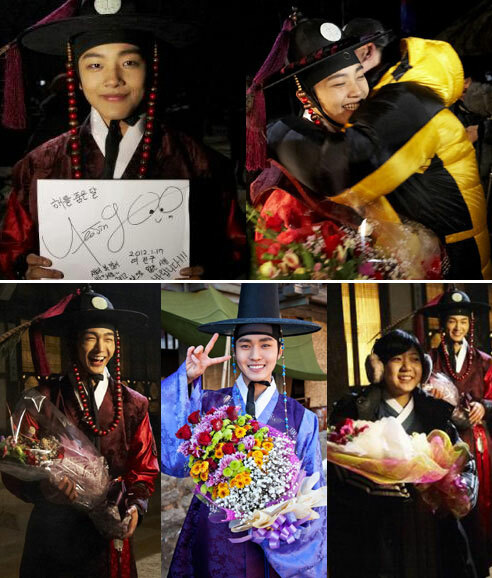 On January 20th, 2012, the official Twitter account of MBC’s The Moon Embracing the Sun published the behind the scene photos of Yeo Jin Goo (crown prince), Lee Min Ho (Yang Myung), Lim Si Wan (Heo Yeom) and Lee Won Geun (Woon) on the set. Yeo Jin Goo wrote on a paper “Happy New Year. Hope can support The Moon Embracing the Sun in future” together with his signature, and took a photo. Lee Min Ho and Lim Siwan also took photos with a bright smile while holding bouquet. The child actors ended their appearance in episode 6, replacing with adult actors.